* Skin cancer occurs when skin cells become damaged and reproduce at an abnormal rate. Skin cancer is one of the most easily treated cancers with over ninety percent of those diagnosed making a full recovery. * There are two types of skin cancer: melanoma and non-melanoma. Non-melanoma is the slower growing of the two and makes up most of the cases of diagnosed skin cancer. 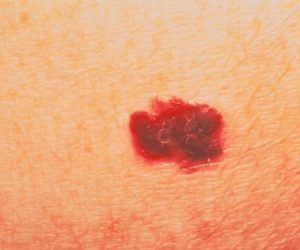 Melanoma is not as common as non-melanoma but is a more aggressive form of skin cancer. It is more likely to spread to other areas of the body — of the 9,000 skin cancer deaths in the US each year, 7,000 are likely to be from melanomas. * There are a number of known causes of skin cancer, the primary being excessive sun exposure. Other causes of skin cancer include a history of being sunburnt, destruction of the ozone layer, heredity, tanning salons, exposure to halogen lighting, people with freckles or odd shaped moles, skin color – fair skinned, redheads, blue eyed blondes or albinos are at higher risk, and men are three times more likely to develop melanoma than women. Exposure to radiation and pesticides, a depressed immune system, prolonged or continual emotional or mental stress, and smoking have also been linked with cancer. * Always cover your skin from the sun, even in winter and when in the snow. Use wide brimmed hats or legionnaire’s hats, which cover the head, neck and shoulders from the sun. Always wear sunscreen, moisturizer or cosmetics with sunscreen, SPF 30 is highly recommended. Wear long sleeved clothing when in the sun for prolonged periods. Wear sunglasses to protect the eyes and avoid the sun between 10:00 am and 2:00 pm. Avoid sun bathing at all times, including tanning salons. Prevent your children from getting sunburnt and teach them the dangers of excessive sun exposure. * Address Obesity Problems – the American Cancer Society recommends maintaining weight at a healthy level to reduce the risk of cancer. * Quit Smoking – smoking and passive smoking increases the risk of some cancers and puts unnecessary strain on a body trying to survive cancer. See smoking for information on how to quit. * Avoid Chemicals – many chemicals are carcinogenic and have unknown long term effects. It is safer to avoid exposure to chemicals as much as possible. * Stress Management – the mind has a powerful influence upon one’s health, and techniques such as meditation, yoga or breathing exercises should be a part of your daily stress management program to reduce the risk of cancer, or to help the body to cope with cancer treatment. * Self Examinations and Checkups – it is recommended that you regularly perform self examinations to look for suspicious lesions or for any change in skin appearance. * Avoid medications such as antibiotics, antidepressants, diuretics, antihistamines, sedatives and estrogen as these may make your skin more susceptible to sun damage. * Regular Exercise – the American Cancer Society recommends at least 30 minutes of exercise daily as a preventative measure against cancer. * Dietary Changes – diet may help as a preventative measure against skin cancer. If you have been diagnosed with skin cancer, positive dietary changes that may help your body to cope better with chemotherapy, radiation or surgery and reduce the factors that contribute to disease. – Eat vitamin E in your diet as it is thought to protect the skin from UV damage. – Reduce fat intake – high fat diets have been linked with cancer. – Eliminate animal flesh products. Animals are often treated with hormones and consume foods contaminated with pesticides; these chemicals are taken into your body when you eat meat and other animal products. Many studies have found a direct correlation between high intake of animal protein and some cancers. – Avoid alcohol, caffeine products, processed foods or foods with additives, salt, sugar and white flour. – If possible, eat organically grown food, as pesticides have been linked to cancer. * Eat a vegetarian whole foods diet, high in antioxidants including whole grains, legumes, oats, onions, berries, garlic, citrus, broccoli, carrots, sweet potato, brussel sprouts, nuts, seeds, yams, pumpkin and leafy green vegetables. Skin cancer responds well to treatment. Conventional therapies available to treat skin cancer include excision of the tumor (the most common treatment, used especially for cases detected early), while radiation and chemotherapy are used for more advanced cases. Chemotherapy and radiation have many side effects and it is necessary to include other therapies such as diet, vitamin, mineral and herbal therapies into your regimen to improve the chances of a successful recovery. Please consult your nutrition oriented physician for further information. If skin cancer is diagnosed and treated early enough in its progression, it is highly likely that you will be able to go on and lead a normal life after treatment. VITAMIN A – Contains anticarcinogenic phytochemicals shown to reduce the risk of some cancers. Vitamin A helps stimulate the immune system and is used in skin repair and maintenance. Natural sources of vitamin A include yellow fruits and vegetables, rose hip, sage, spinach, spirulina, alfalfa, asparagus, dandelion greens, red peppers, apricots and peaches. 50,000 – 100,000 iu for ten days in divided doses of emulsion form, reduced to 50,000 iu for thirty days, and 25,000 iu daily after that, may help if you have skin cancer otherwise take according to label instructions. Doses over 10,000 iu per day may cause birth defects if taken by pregnant women. Women of childbearing age are advised not to become pregnant during such a course or within one month after ceasing a course. VITAMIN C – With bioflavonoids. Vitamin C is thought to reduce the risk of cancer and to lower death rates of cancer sufferers due to its antioxidant properties, which protect tissue from damage caused by free radicals. Vitamin C may also be used to prevent damaging side effects from chemotherapy and radiation. Natural sources of vitamin C include citrus fruits, berries, alfalfa, fenugreek, parsley, peppermint, tomatoes, pineapple, papayas, kale, spinach, brussel sprouts, onions, mangos, peas, persimmons and kelp. 5,000 – 20,000 daily in divided doses may help if you have skin cancer otherwise take according to label instructions. Do not use more than 5,000 mg daily if pregnant. Use esterified vitamin C if you use aspirin. Large doses of vitamin C may cause diarrhea, may deplete the body of copper and affect the reliability of oral contraceptives. VITAMIN E – Promotes healthy skin, helps to reduce the risk of cancer. The antioxidant properties protect cell membranes from attack from free radicals and Vitamin E is used in cell repair – important if you are undergoing chemotherapy, radiation or surgery. Natural sources of vitamin E include dark green leafy vegetables, cornmeal, milk, sweet potatoes, flaxseed, dandelion, soybeans, legumes, cold pressed vegetable oils, nuts, whole grains and seeds. 400 – 1,000 iu daily may help if you have skin cancer otherwise take according to label instructions. BETA CAROTENE – Protects against cancer by scavenging free radicals and is needed to repair tissue. 15,000 iu daily may help if you have skin cancer otherwise take according to label instructions. SELENIUM – Some studies have shown that people who have a diet low in selenium have increased risk of developing cancer. Selenium works synergistically with vitamin C and A, has a powerful antioxidant effect, protects the skin from UV damage and aids in digesting protein. Natural sources of selenium include dairy products, garlic, molasses, kelp, nettle, ginseng, fenugreek, fennel seed, chamomile, wheat germ, brown rice, alfalfa, whole grains and sarsaparilla. 200 mcg daily in divided doses may help if you have skin cancer otherwise take according to label instructions. ASTRAGALUS, HUANG QI – Stimulates the immune system, assists in healing and digestion, improves fatigue and is used for cancer and after chemotherapy. Take according to label instructions. Works well if used alternately with echinacea. Do not take if a fever is present. Do not use for more than ten consecutive days. CHAPARRAL – A free radical scavenger, helps during radiation, a pain reliever and reduces the risks of cancer. Take according to label instructions. Chaparral in large or prolonged doses may damage the liver. DANDELION – Is thought to reduce the risk of cancer. Take according to label instructions. Avoid dandelion if you have ulcers or gall stones. ECHINACEA, PURPLE CONEFLOWER. – Stimulates the immune system. Works well if used alternately with astragalus. Do not take if you are allergic to plants in the sunflower family. Do not use if you have an autoimmune disease or have a progressive disease such as multiple sclerosis or tuberculosis. GARLIC – Stimulates the immune system, detoxifies the body, improves circulation. Is used for cancer. Take 2 – 3 capsules daily in divided doses. Seek medical advice before taking garlic if you are taking anticoagulant medication. GINGER – Helps to alleviate the nausea and vomiting associated with chemotherapy and radiation and mproves circulation. 1 gm daily in divided doses may help. Do not use for a prolonged period during pregnancy or if you have gallstones. GREEN TEA – Is thought to reduce the risk of cancer. Drink daily. HORSETAIL, SCOURING RUSH, SHAVE GRASS, BOTTLEBRUSH, SILICA. – Promotes healthy skin. Use according to label instructions. Do not take if pregnant. PAU D’ARCO, TAHEEBO, LAPACHO – Used in cancerfor its healing and cleansing properties. Use according to label instructions. COMFREY, KNITBONE – A poultice of comfrey, pau d’arco, ragwort, and wood sage over the infected area may help with skin cancer.